Neil Lennon has left Hibernian but the head coach has "not been dismissed" and has "not resigned", the Scottish Premiership club have said. 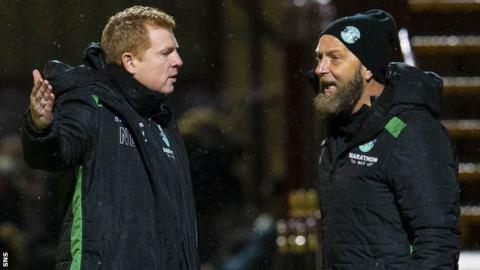 Lennon, 47, was suspended on Friday following an exchange between himself and several club employees. It has been reported that Lennon and assistant Garry Parker were told to stay away after striker Florian Kamberi was criticised at a team meeting. Hibs said the duo had left their positions by "mutual consent". "Despite widespread speculation, the club confirms that neither Neil nor Garry has been guilty of any misconduct or wrongdoing and no disciplinary process has been commenced," the statement read. "The suspension, put in place to allow an internal review, was lifted by the club as part of this agreement." The statement added that both Lennon and Parker "consider that it would be in the best interests of all parties to part amicably" and thanked them for their efforts. Lennon also offered his thanks to "the board, the coaching staff, the players and all the fans for making the last two and a half years so enjoyable". He added: "It has been my privilege to serve the club and I wish it every success in the future." Former Celtic and Bolton Wanderers boss Lennon took over at Easter Road in the summer of 2016 and lost just three league matches in his first season as Hibs ended a three-year period in the Championship. On their return to the top flight, the Edinburgh side finished fourth with a record points tally. This term started well, with Hibs sitting second after eight games, but Sunday's victory at St Mirren - under the command of Eddie May and Grant Murray - ended a run of five league games without a win. It lifted them up to seventh place - five points behind St Johnstone in sixth and seven behind city rivals Hearts. Hibs have also reached the Scottish Cup last 16 and will host Raith Rovers next month. Head of academy coaching May said on Sunday he does not want to succeed Lennon, while former Hearts player Murray has been coaching with the club since 2015.